Photo: Ambassador of Italy to the UN, Sebastiano Cardi, Ambassador of Iceland to the UN, Einar Gunnarsson and the Chief of the UN Treaty Section Santiago Villalpando on 17 June 2016. Legal scholars debate crime of aggression amendments: Last week, Professors Claus Kreß and Harold Koh led a spirited discussion on some of the details of the Kampala Amendments in New York. They discussed the activation of the ICC’s jurisdiction over the crime of aggression in 2017, including the precise extent of the Court’s jurisdiction as well as the question of humanitarian intervention. Don’t miss the arguments raised by Stefan Barriga, Liechtenstein’s Deputy Permanent Representative to the UN and co-drafter of the Kampala Amendments, at 1:01:15, as to how some of the concerns raised can be met with pragmatic solutions – especially in light of the fact that the amendments establish a very limited, consent-based jurisdictional regime. Carrie McDougall, Legal Adviser of the Australian Mission to the UN, at 1:10:15, noted that for those States that have ratified the amendments, there are no jurisdictional ambiguities – meaning that ratifying the amendments would help solve any remaining questions in this regard. The International Criminal Court and the Crime of Aggression from German Center for Research and I on Vimeo. 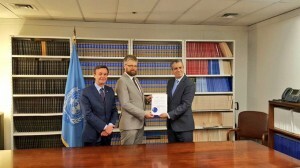 El Salvador ratifies amended version of the Rome Statute: On 3 March 2016, Hugo Roger Martinez Bonilla, Foreign Minister of El Salvador, deposited his country’s instrument of ratification of the amended Rome Statute. El Salvador thus became the first country to ratify the Statute and the Kampala Amendments at the same time – it will be the 124th State Party to the Rome Statute and the 28th State Party to the Kampala Amendments. El Salvador’s ratification once again underscores Latin America’s strong commitment to the International Criminal Court – all but one Central American States have now joined – all of South America is already within the Court’s jurisdiction. The Campaign is hopeful that future States joining the Rome Statute will follow El Salvador’s lead and ratify the amended Statute. With several other domestic ratification processes complete or nearing completion, we remain on track to achieve the milestone of 30 ratifications in the first half of this year. Photo: Hugo Roger Martinez Bonilla, Foreign Minister of El Salvador deposits his country’s instrument of ratification. Stephen Mathias, Assistant-Secetary-General for Legal Affairs of the United Nations, receives the instrument. 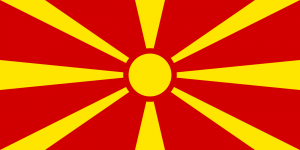 Macedonia ratifies Kampala Amendments, adopts implementing legislation: On 1 March 2016, Macedonia (FYROM) deposited its instrument of ratification of the Kampala Amendments with the Secretary-General of the United Nations. 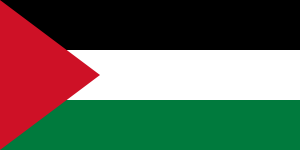 Its parliament had approved both the ratification and the adoption of implementing legislation in early February. Macedonia is the 27th State Party to the Kampala Amendments. With several other domestic ratification processes complete or nearing completion, we remain on track to achieve the milestone of 30 ratifications in the first half of 2016. 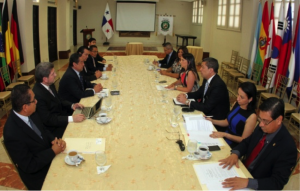 Proposal presented to implement Kampala Amendments in Panama: On 2 February 2016, the Bar Association of Panama presented a Draft Statute implementing the Kampala Amendments into the Panamanian Criminal Code to the Ministry of Foreign Affairs. Inclusion of the crime of aggression in the criminal code would be an important step towards the ratification of the amendments, a process on which Panama has been actively working (see our Status Report). For more information, see the Ministry of Foreign Affairs’ press release (Spanish). Photo: President of the Bar Association of Panama presents draft Statute to for the implementation of the Kampala Amendments to the Vice Minister of Foreign Affairs. Courtesy of the Ministry of Foreign Affairs of Panama. Crime of aggression now outlawed in Austria: On 1 January 2016, Austria’s amended criminal code entered into force, for the first time defining the crime of aggression as an offence (article 321k). The definition of the crime is based in large parts on the definition of Kampala. The crime of aggression is punishable in Austria with a prison term of five to ten years, provided that the crime either originates in Austria or has Austria as its target. The code also allows for the prosecution of crimes of aggression committed without such a link, provided the perpetrator is found on Austrian territory and cannot be extradited for criminal prosecution. The current version of the Austrian criminal code is available online (German).